I am happy to announce that the winner of Caption Contest 43 and a custom black and white illustration of whatever he likes by yours truly is Rob Rogers! GL: The spider just caught a couple of flies. You know what that means? Batman: Bring out The Gimp! GL: Did you remember to put out the crackers? BM: Crap, I think I left them in my other utility belt. GL: I only agreed to meet your fan club if you would introduce me to the hottest members. BL: …Those three are the hottest. 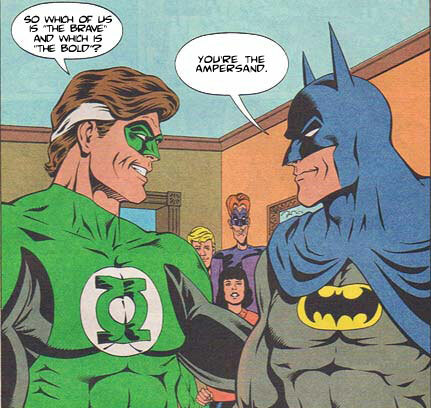 Green Lantern: Batman why are you smiling? Batman: Because I am about to beat you to within an inch of your life. I can see why two-balloon panels don't work as well, I think they're a lot harder to make funny and pithy. I think I'll go back to the one-panel weird looking ones for the foreseeable future. Thanks to everyone who entered, and congratulations again to Rob.